The GLOCK 19 Gen5 showcases the latest technology and engineering that drives GLOCK's constant pursuit of perfection. 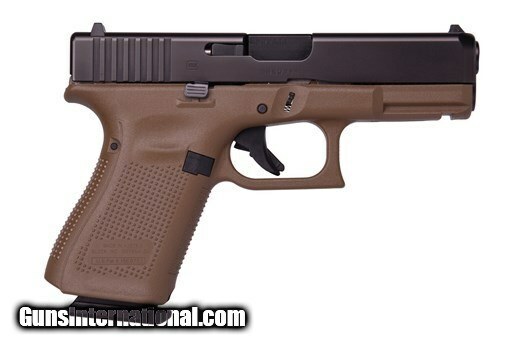 The G19 Gen5 features over 20 design modifications from its Gen4 predecessor, including the GLOCK Marksman Barrel, an nDLC finish, ambidextrous slide stop levers, a grip with no finger grooves, and a flared mag-well, all wrapped in a package perfect for concealed carry or use as a back-up weapon. These changes deliver improved accuracy, durability, performance, control, and flexibility in both low-stress and high-stress situations. The new Glock Gen5 magazine comes with an orange follower and a floor plate which is extended at the front for faster magazine change. Every Glock Gen4 and Gen5 model comes with backstraps in two sizes, each one with or without beaver tail. The multiple backstrap frame allows the users to change the circumference of the grip to fit their individual hand size. The magazine catch of the Gen4 and Gen5 frames is reversible and enlarged towards the rear of the pistol. The reversible magazine catch is more user friendly to the shooter's reach and allows them to switch the catch to the left or right side of the pistol. The Gen4 and Gen5 have a rough textured frame (Gen4 RTF) surface designed to enhance grip traction, without being too aggresive. It is present on the frame as well as on the interchangeable backstraps.